Cilla Lee-Jenkins is 50% Chinese, 50% Caucasian, and 100% destined for literary greatness! In this middle grade novel, she shares stories about a new sibling, being biracial, and her destiny as a future author extraordinaire. Priscilla "Cilla" Lee-Jenkins is on a tight deadline. Her baby sister is about to be born, and Cilla needs to become a bestselling author before her family forgets all about her. So she writes about what she knows best—herself! And Cilla has a lot to write about: How did she deal with being bald until the age of five? How did she overcome her struggles with reading? How do family traditions with Grandma and Granpa Jenkins differ from family traditions with her Chinese grandparents, Nai Nai and Ye Ye? 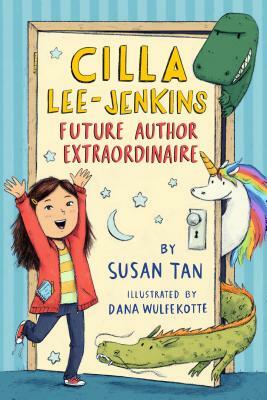 Written by Susan Tan and illustrated by Dana Wolfekotte, Cilla Lee-Jenkins: Future Author Extraordinaire is a novel bursting with love and humor, as told through a bright, irresistible biracial protagonist who will win your heart and make you laugh. Susan Tan has lived many places in her life, but calls Concord, Massachusetts, home. She grew up in a mixed-race family, and, like Cilla Lee-Jenkins, had very little hair until the age of five. After studying at Williams College, she earned her PhD from the University of Cambridge, where she studied children's literature. She currently lives in Somerville, enjoys frequent trips to Chinatown to eat tzuck sang, and teaches at the University of Massachusetts, Boston. Cilla Lee-Jenkins: Future Author Extraordinaire is her first book. Dana Wulfekotte is a children’s book author, illustrator, and animator. She graduated from the University of Pennsylvania and lives in Queens with her boyfriend and two rabbits (whom she now regrets not naming Supernova and Sparkledust).